Here we go again. Well, sorta. 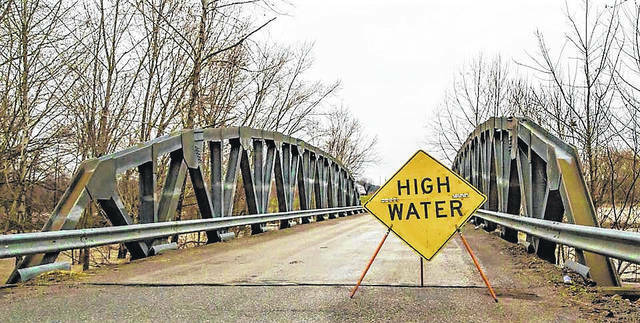 The Scioto River, orginially expected to crest just slightly above flood stage, is now expected to surpass the flood mark by about seven feet, which will result in moderate flooding near Piketon. Tuesday’s heavy rains contributed to the forecast change by the National Weather Service in Wilmington, and are expected to result in minor flooding along the Ohio River when the river crests almost two feet above flood stage. Flood stage for the Scioto River is 20 feet, and orginal NWS expectations were for the river to crest at 21.6 feet. But after a line of heavy thunderstorms barreled through southern Ohio Tuesday night and brought torrential rains, the river is now expected to crest near 27 feet by this morning. The flooding, however, is expected to be short-lived, falling below flood stage by midnight Friday. At stages near 23 feet, the NWS says backwater flooding worsens along creeks flowing into the Scioto River. Stretches of several low-lying roads near the river are flooded. Scioto and Camp Creek Townships in southern Pike County are expected to experience the most significant flooding. Meanwhile, the Ohio River is expected to swell to above its 50-foot flood stage by Friday morning, and to crest at 51.7 feet by noon Saturday. Minor flooding is expected to subside by noon Sunday. As of Tuesday afternoon, a spokesperson for the Pike County Sheriff’s Office said some minor flooding had already struck the area. State Route 124 was closed Tuesday because of high water, and other roadways are expected to be impacted through Friday. Also, state Route 772 near Rarden is closed until further notice after a landslide covered the roadway. Recent rains are believed responsible for eroding the integrity of the hillsides in the area. Tuesday’s line of thunderstorms ahead of a cold front produced heavy rain and strong winds, which continued Wednesday. Parts of Scioto County were under a tornado watch during the height of the storms, and tornadoes were reported between Dayton and Columbus. There were no reports of personal injury or substantial loss of property associated with the funnels. Temperatures are forecast to fluctuate during the next few days. After Tuesday temperatures in the high 70s, Wednesday highs were about 35 degrees colder, and the low was expected to be in the high 20s this morning. Highs today and Friday are expected to be in the 50s, before daytime temperatures plunge into the 30s for Saturday and the mid-40s on Sunday. Light snow is possible Saturday as temperatures are forecast for the low 20s by Sunday morning. The NWS has also issued a freeze warning for southern Ohio for the overnight hours through the weekend. Frost and freeze conditions may damage sensitive vegetation, so any preventive steps to protect plants should be taken as soon as possible.